The Grizzly Den is an amazing place to call home during your visit to Yellowstone Park. This is 3 bedroom home, with an open loft area(with pull out sofa), and another loft area with a futon. Located above the banks of the Yellowstone River less than a mile from the north entrance to the park in the heart of Gardiner, MT, it has 18 windows facing south into the park highlighting stunning views of 11,000 ft Electric Peak. You can literally look out the windows, or off the deck and see: elk, antelope, deer, and occasionally bears and wolves roaming the hillsides of Yellowstone. No problems at all to report. A great place to stay for medium-to-large families or groups of friends. We had a good experience staying here and it was very comfortable, cute and spacious enough for our four. We would book this place again with no hesitation. Weather was chilly so didn’t get to enjoy the deck but it would have been a great hangout with wonderful view of river and mountains. Owner was friendly and responsive. Giving 5 stars but adding a few minor notes: never could find dish cloths or dish towels (and we didn’t ask so that’s on us but suggest storing in a more obvious place if they were in condo). Bathtub downstairs may have been missed by cleaning crew but otherwise all was clean and good to go. A good stay and wish we had longer. Cozy, nicely laid out, plenty of sleeping space and room for everyone. The cabin had a few problems. The downstairs sink drained very slowly and the hot water handle leaked. My husband fixed a few minor things, like the curtain rods in the bathroom, tightened the ceiling track lights in the kitchen and fixed the internet connection. The place was very well insulated and we rarely needed the heat, with 28 degrees temps outside. Great location! Loved being next to the river and so close to Yellowstone. Elk walked around the town, as well as mule deer. Comfortable beds and great water pressure in the showers. We enjoyed the deck, too. Overall, we liked this place a lot and would recommend it for however long you want to say. We loved sitting on the deck in the evenings after a long day in the park. We enjoyed listening to the river. Everything was wonderful. The accommodations were great for my family!! I would love to bring them back one day. Grandkids loved the Grizzly Den!!! A very convenient, picturesque cabin that is great to stay in when visiting Yellowstone. The cabin was stocked with everything you need - including toilet paper, shampoo, etc. Plenty of good pots and pans for cooking. The back porch was wonderful, with a view of the mountains and river. Sleeping accommodations were plentiful, but the beds are very high. You can walk to restaurants, and the entrance to Yellowstone is 2 minutes away. We are 1 mile from Roosevelt Arch. Our cabin sits directly above the Yellowstone River - we have a large deck with bbq and seating - you can watch the river roll by and enjoy the rafters below. There are restaurants, entertainment, coffee shops, rafting all within a mile of our cabin. 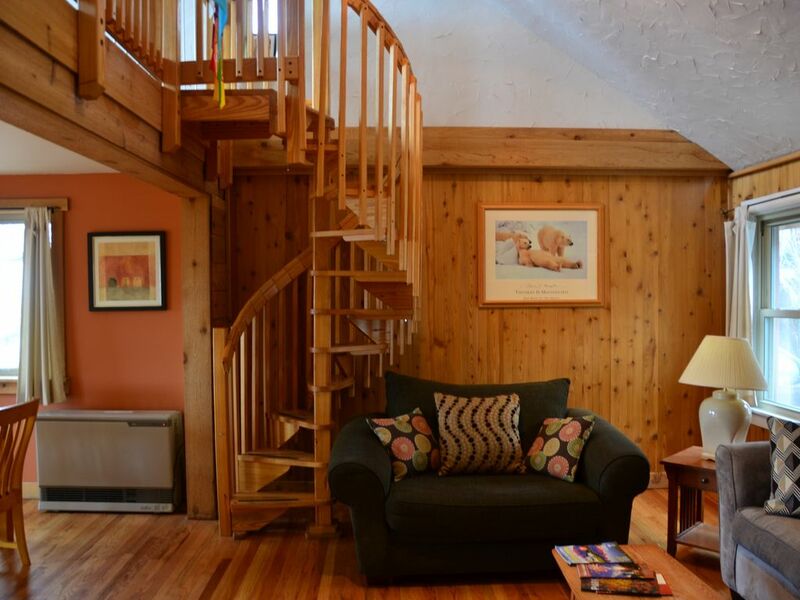 This cabin has lots of great private spaces and a really creative layout. Large groups can all find a place to call their own in this cabin. CANCELLATION POLICY: cancellation more than 60 days before your planned arrival: refund 100% of monies received less $100.00 administrative fee, cancellation 30-60 days 50% of full reservation cost will be refunded. Cancellation under 30 days all monies received are forfeited.